Hi folks! This is the first author interview post I’m doing here. I hope to do more in future, though I haven’t got any lined up. If you think you’d be interested in being interviewed on this blog, get in touch with me at bibliophibianbreathesbooks@gmail.com and let me know what books you’ve got out there and why I should be interested. Lynn E. O’Connacht has been mentioned a few times on my blog before. 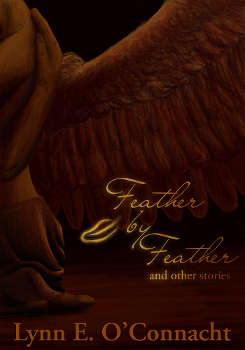 She’s a friend, and she recently has an ebook out on Smashwords, Feather by Feather and Other Stories. (Amazon UK, Amazon US.) 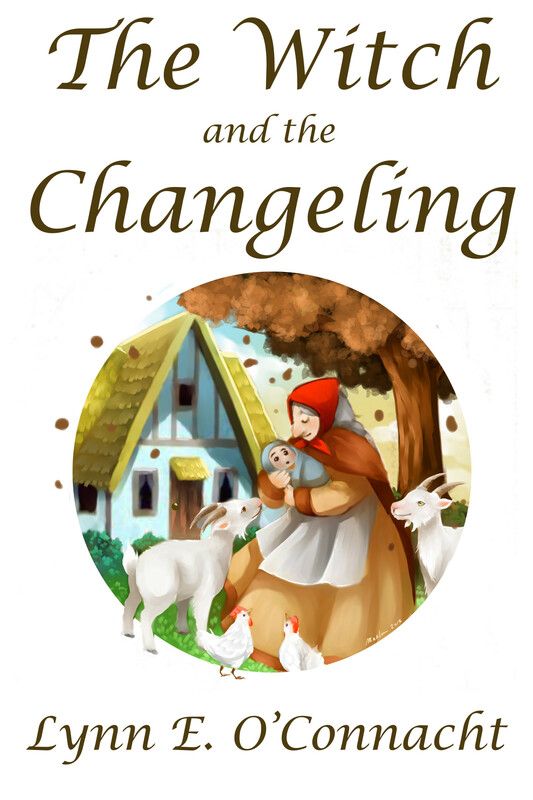 She has two short stories available for free, too: The Witch and the Changeling, and The Swan Maiden. I encourage you to check out her work, especially if you find this interview interesting. Hi, Lynn. What’s the first thing you’d like new readers to know about you? Is there a particular story you’d recommend they start with? Hi. ^-^ Thank you for having me. You’re a sweetie. The first thing I’d like new readers to know about me… Hmm… You don’t start with easy questions, do you? *laughs* I guess the first thing I’d like readers to know is that I appreciate their taking a chance on my stories and hope they’ll enjoy them and… That’s not really where you were going with that question, was it? *thinks* No, I’m sorry. That’s all I’ve got. 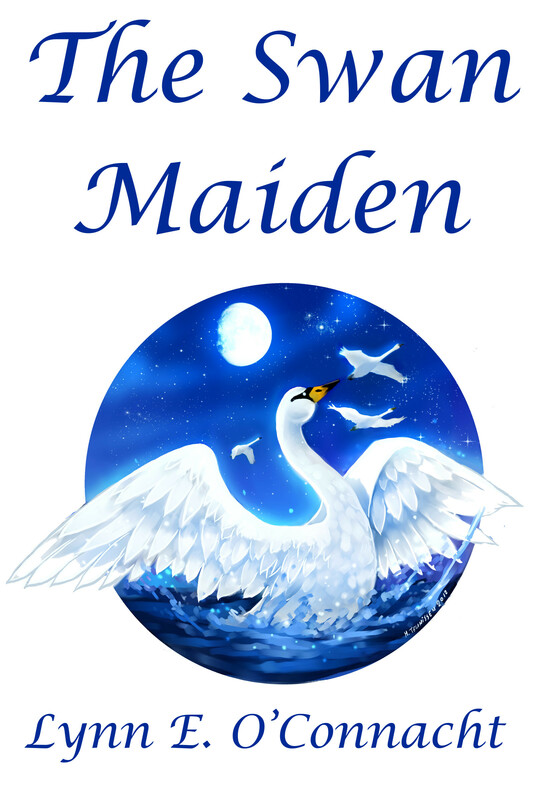 As for a story to start with… I’d suggest either The Swan Maiden or The Witch and the Changeling, actually. They’re both also collected in Feather by Feather, but they’re free and they’ll give readers a good idea whether they’ll like my general style before buying (or sampling) the collection. The first is a short fantasy romance and the second is a brief folktale-esque story about, well, a witch and a changeling. If you’ve picked up Feather by Feather already then I suggest reading them in order. I’ve tried to mix up the weaker and the stronger stories, so there’s no perpetual low at any point. You’re self-publishing your work, so I’m wondering: is that a decision that took a long time to come to, or was it a no-brainer? Do you hope one day to go the mainstream route, or are you enjoying your freedom? It’s a little bit of a mixed bag. I’m actually working on becoming a hybrid author, someone who’s both traditionally published and self/indie-published. I have enjoyed the freedom a lot and I admit that it’s a major factor in my decision, even though it actually makes more financial sense for me to plug away only at traditional venues. I’ll have to see what the future brings, but I doubt I’ll go traditional-only. I wouldn’t able to write all the stories I want to the way I want to. What’s the most challenging thing about self-publishing your work? Hmmm… Depending on when you ask me that’s probably hitting the publishing button or getting the word out. (Hitting that button is so, so scary.) But getting the word out is pretty challenging too. One of the best ways to introduce people to your book is by word-of-mouth and bloggers, but a lot of bloggers, especially the bigger names, won’t accept self-published titles for review at all. The last time I was active in the book blogging community I didn’t accept self-published titles either. Part of that is because I didn’t have a way to read ebooks at the time and sending print books overseas is very prohibitive, but I admit that another part of it was the stigma about the quality of self-published works. I’ve had several absolutely wonderful experiences with indie authors since then, though, and I hope I’ll be like that for other readers out there too. There are some stories that come easy, and some that really don’t. What was the hardest story to write? Do you love it more or less because of the effort? The hardest story to write in Feather by Feather? That’s probably a toss-up between the peeweww stories or The Passage of Pearl. Every story, easy or hard, comes with its own set of challenges, so they were all difficult for their own reasons. Those two are just the ones I suspect were the hardest. The peeweww stories were hard because I’m a non-visual writer and every aspect of those stories rely on visuals. There are no humans, or even humanoid characters, in the peeweww pieces, so the narrative needs to be heavier on the description to get the world across. Not only that, but peeweww communicate through imagery. With The Passage of Pearl I just struggled a lot to get balance right and there were a fair amount of external things that kept going wrong and undermining my confidence in the piece as a whole. I’m really pleased with how it turned out, though! It’s a very quiet novelette. What was the first fantasy book world you remember getting lost in? Does it still seem so exciting to you today? My dad read it me when I was a teeny tiny Lynn and couldn’t read by myself and it was the only book he ever did read to me. He’s dyslectic and doesn’t like reading because it’s really hard for him to do, so it holds some very special memories and it always crops up when I’m asked a question like this. Quite early in our acquaintance, we had a conversation about narrators which changed my viewpoint on it entirely. Would you like to ramble a little bit about that here? Do you have any suggestions of authors who do it right? I can certainly try to ramble a bit about it! I think first person narratives are the most difficult to write well. What I look for in a first person narrative is relatively simple from a reader’s perspective: I want a story that convinces me the narrator would be telling this story to reader (or writing it down) and I want the narrative voice to fall apart, more or less, when I’m substituting the pronouns with third person ones. Failing that I’ll settle for a story or set of characters that’s at least compelling enough to ignore the issues I’m having with the narrative. From a writer’s perspective, what I want is really, really hard. They’re extremely high standards and I’ll freely admit that I don’t meet them either. Most authors don’t. Those that do tend to have written an epistolary (such as Lord Byron’s Novel: The Evening Land by John Crowley), made the narration a central part of the structure (Chime by Franny Billingsley), or have a very clear and defined voice (The Curious Incident of the Dog in the Night-Time by Mark Haddon). So those are three examples of first person narratives I find well-done for various reasons. I’ve actually had to lower my standards a little since we had that conversation, since I had a fairly long streak of books that were in first person, failed to do what I wanted them to do, and still didn’t make me want to throw them against a wall in frustration. I’m still trying to work out what those authors are doing differently, so I haven’t quite refined what I’ve learned into words yet. I also really appreciated the first person narration in The Good Soldier by Ford Maddox Ford works. It’s one of the best examples of an unreliable narrator that I’ve read. And, of course, Jo Walton’s first person narratives. I have a bit of a hit-and-miss relationship with her works, but I do appreciate the way she tackles first person. And here’s a silly one to finish on: if you had the opportunity to have dinner with an author (living, dead, it’s all possible for our purposes here), and no issues of shyness would get in the way, who would you pick? I like the circular nature of the difficulty of these questions. I know that’s not intentional, but still. It amuses me and I’m a silly. I think… Charles de Lint or Guy Gavriel Kay. I’ve loved almost every book I’ve read by them and I think if shyness wasn’t an issue I’d find talking about writing and whatever else we’d drift onto absolutely fascinating and quite educational. Thanks for answering my questions! It’s lovely having you here on my blog. On 22 November 2013 23:44, Bibliophibian Inc. This article needs an editor. No wonder she published it for free. Maybe when she grows up she will write something for grown ups. Good to see armatures having a go. It is so sweet. “Bloggers” (lol) like you, are so distasteful, like a stiff fart in an unblowing wind. It’s spelt “amateurs”. And Lynn didn’t publish her book for free — she’s published two short stories from it for free. Reading comprehension: not just for MAs in literature!